Do you have students who need help with some early literacy skills? Or students who have mastered most of the skills, but have some difficulty following directions, so they often answer questions wrong, even though they understand the concept? I needed a way for them to practice general readiness, phonemic awareness, phonics, and structural analysis skills, so they would feel more confident when taking tests and learn to analyze directions so they didn't get questions wrong because they weren't paying attention to the key words in the questions. 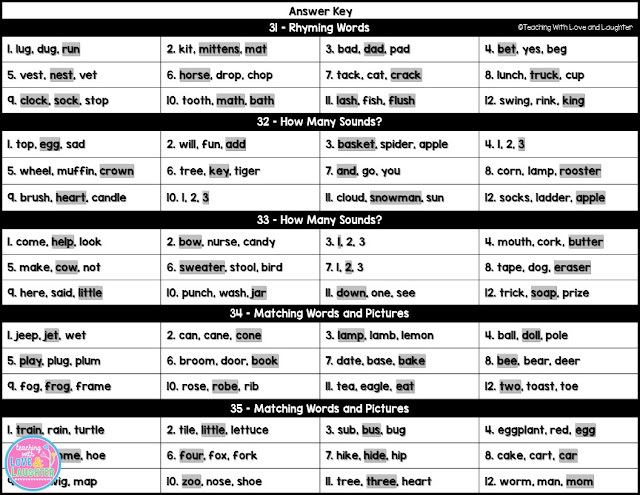 So, I came up with these early literacy practice pages. I've been using them in small groups and they are really helping students to think about what the questions are asking and to look at each answer choice carefully. Many of them contain answer choices that are similar and look correct. Most of the skills contain 2 different activity sheets, and there are some that contain more. 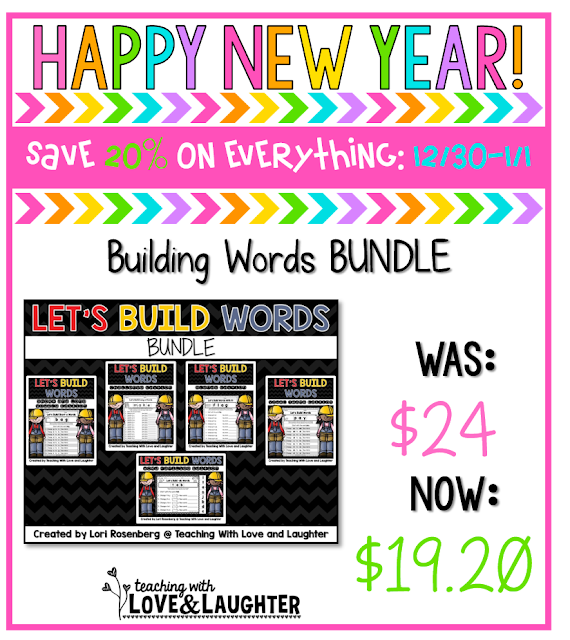 Blends has 3 different sheets, mixed review has 4, and word families has 5 different sheets. Here is an example of one of the sheets. See how some of the wrong answers look like they could be right, if you don't pay close attention to the question? This one is all about rhyming. 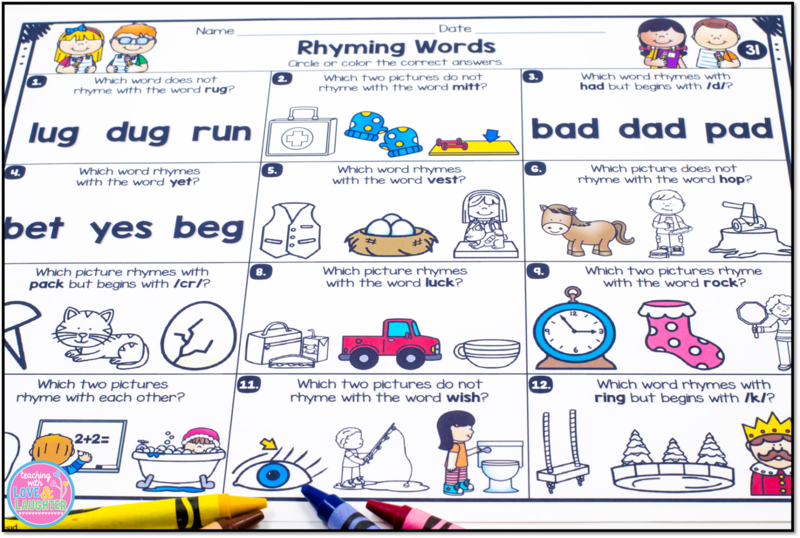 I came up with quite a few different ways to test the children's understanding of rhyming. When I complete a sheet with an individual or small group, we go very slowly. I help the children read the questions and identify the pictures with them. These sheets were not created for children to complete independently. So many teachable moments would be missed! Once an answer has been chosen, we discuss why it is the right (or wrong) answer. It is very interesting, and very telling, to hear the children explain why they chose an answer. It is during this conversation that children usually figure out if they chose the wrong answer. I tell them that they fell for my trickery and to be super careful not to let that happen. They love the challenge! Answer keys are included for teachers to refer to. I highly suggest using it because it will tell you what each picture depicts, just in case you can't figure it out on your own. 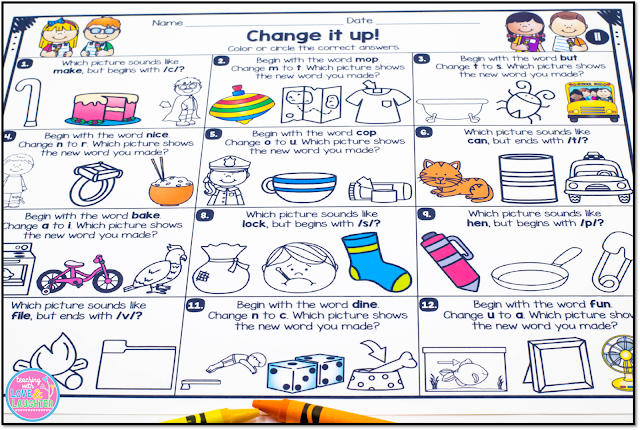 If you are looking for a great way to help students who have difficulty with a few or many early literacy skills, or students who don't read or listen to directions very well, then you may want to check these out. You can find them by clicking here or on the image below. You can grab them on sale now through January 1, along with the rest of my store. 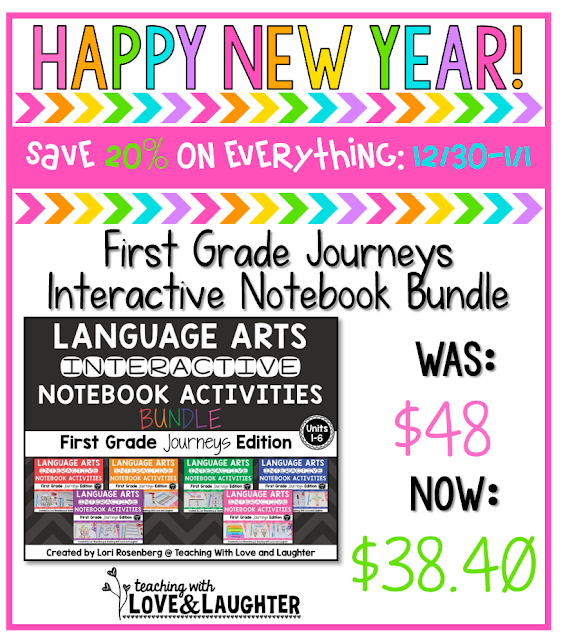 Everything is on sale to celebrate the New Year! Now is a great time to grab some new activities to get you through the next few months. Just click on each image to see the item in my store! I am loving the early literacy practice pages. Perfect for my struggling firsties. Can't wait to use them in my small groups when we return to school in January. Thanks for the great giveaway! So glad you like them! Thanks so much for entering my giveaway. Happy New Year to you! Thanks for a great giveaway! Happy New Year!! 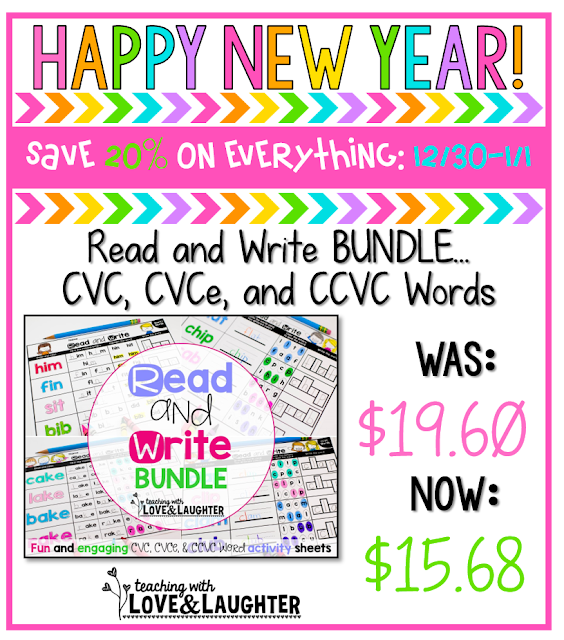 Great giveaway to start the new year! Fingers crossed! Good luck to you! Thanks for entering! Happy New Year! Happy New Year! Thanks for having a giveaway! Happy New Year to you, too! Thanks for entering my giveaway! I'm such a fan of your products, Lori! Thanks so much for all that you do for us teachers. Cheers to a happy and healthy new year!! You're always so sweet, Rachel! Happy and healthy to you, too! Thanks for the opportunity to purchase more amazing products. You're very welcome! Happy New Year to you! I would love to win this. It snowed for the first time today. Some tpt shopping would round out my break nicely! I'm jealous! I love snow! Enjoy! Happy New Year to you! You do the same! Happy and healthy! Same to you, Julie! Hope you have a happy and a healthy! What a nice way to start the New Year. Thank you! You're very welcome! Happy New Year! I am enjoying my break with family and friends! Waiting patiently for 2016 to DIE!! I am ready for a fresh new year! Bring on 2017! Happy New Year!! Yes! Bring it on! Hope your 2017 is HAPPY and HEALTHY! Happy New Year! Thank for having a giveaway! I am new to your blog and products but am checking them out now! 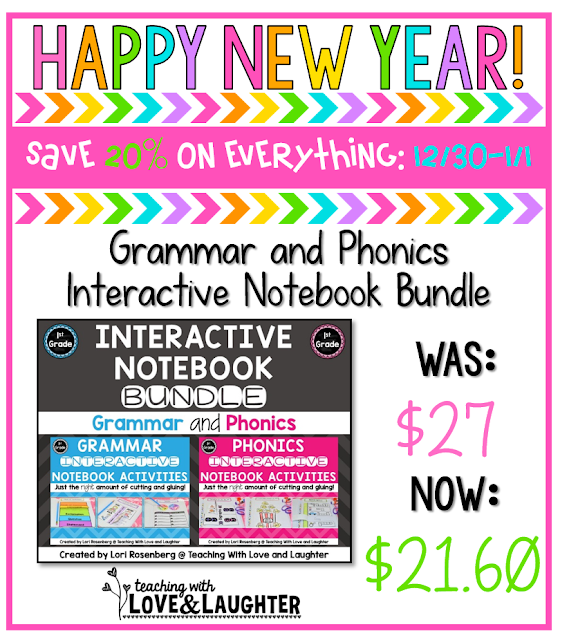 I love your interactive notebooks - I have my eye on first grade phonics and kindergarten word families. 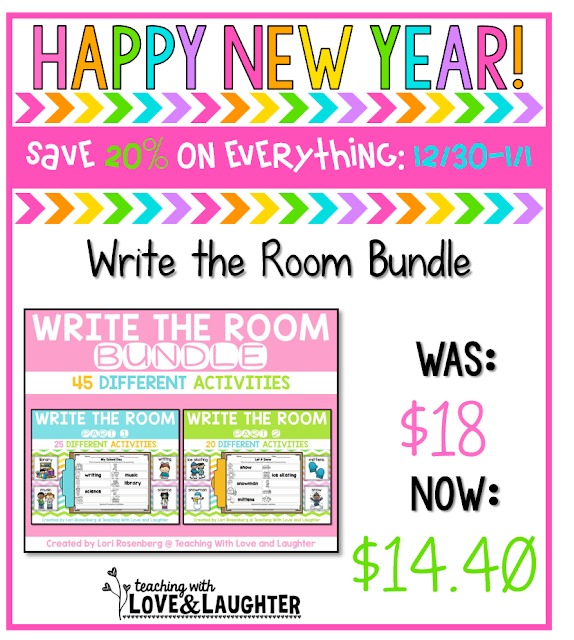 Perfect for the wide range of levels in my kindergarten class! 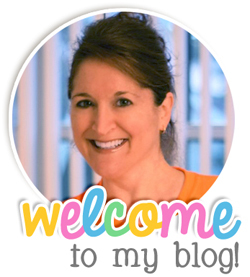 Welcome to my blog, Tanya! Hope you have a very Happy New Year! you put into your products! Thanks for the giveaway and Happy New Year! You're very welcome, Alison! Happy New Year to you, too! How in the world do you have time to make all these awesome resources? Thanks for sharing your ideas! LOL, Anna! It takes me a very long time to complete anything I set out to do! Happy New Year to you! Thank you so much for the chance! Happy New Year!!! Best of luck in 2017! I want to buy everything, it all looks so good. Thank you so much, Angel! That's very kind of you to say! Happy New Year! Thanks for an awesome giveaway! Blessings to you and your family in the New Year! Same to you, Tina! Happy New Year! Thank you for the opportunity! Have a happy new year! Such an awesome giveaway! I am a homeschooling mom of three boys and your products have been such a blessing to our family! Thanks so much for the chance to win! This makes me so happy! Thanks for letting me know! Happy New Year to you!